The Community Kids Mission Action Community (MAC) partners with schools, after-school programs, and non-profit agencies in Pittsburgh that aid in education efforts and protection of children at risk. The MAC supports these organizations financially, and through recruiting volunteers to tutor, serve, and mentor. EECM Extraordinary Tutoring: This after-school program coordinates tutoring opportunities with children who request academic assistance. One-hour assistance is needed for all grade levels between the hours of 3:30 and 7:30 p.m. on Tuesdays through Thursdays. EECM 1st Tee Mentor Program: No experience is required to mentor youth from 5:15 to 7:00 p.m. at Schenley Park Golf Course, January through May. The Neighborhood Academy’s mission is to break the cycle of generational poverty by preparing low-income youth for higher education. The Academy exists to provide a holistic college-prep education for students in grades 8-12 who come from low-income families and is dedicated to developing the minds, bodies, and spirits of students so that they might become fully productive members of our society. Shadyside has participated in The Academy’s capital campaign and offers an annual scholarship for a student in need. SPC also offers a book scholarship to a graduating senior and provides opportunities for parishioners to meet students. To learn about ways you can connect with the great work of The Neighborhood Academy, view a menu of volunteer opportunities (.pdf). As a mission of SPC, the Shadyside Presbyterian Church Nursery School was founded in 1951 to provide a stimulating environment in which children can achieve their potential for social, intellectual, creative, emotional, moral, and physical development. With more than sixty years of experience with pre-school children, the nursery school takes pride in its long tradition of providing a safe, nurturing environment in which our children are encouraged to learn and grow. We believe each child is unique and special. The school has its own board of directors, but remains a mission of SPC. Shadyside Presbyterian has a long history of partnering with Valley View Presbyterian. 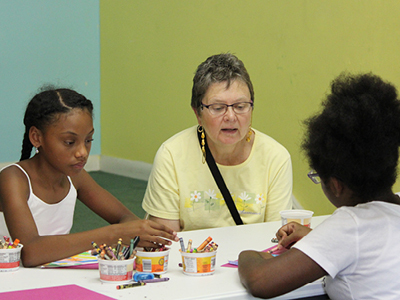 Most recently, Shadyside helped to design and implement the Arts and Crafts portion of the six-week Freedom Camp. Under the leadership of the Valley View team, members from SPC volunteer annually to work with the children during the camp. We are currently exploring other ways to connect members of both churches.